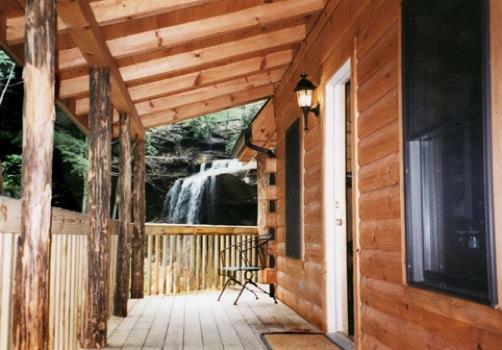 Tranquility Falls is a gorgeous A-frame log cabin with a covered deck overlooking a waterfall tumbling into a ravine. The ravine can be lighted for beautiful night views. 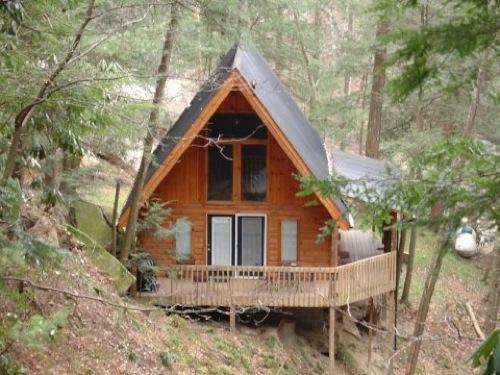 Sleeps 2 adults. 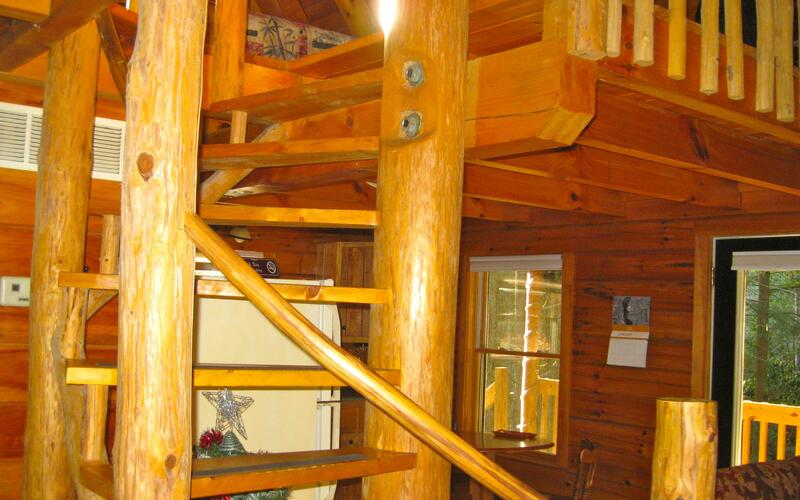 The cabin has a spiral staircase leading to a loft with a king-size bed and half bath. 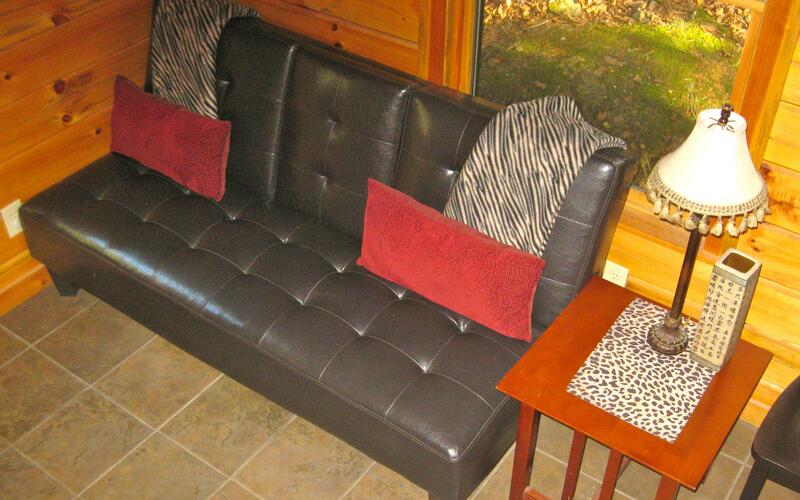 Downstairs is a queen-size futon for additional guests. 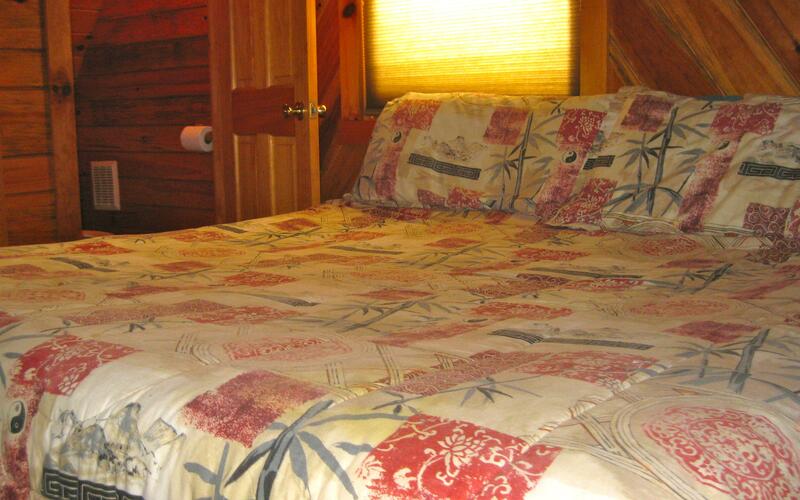 Tranquility has a full kitchen, full bath with two person jetted tub, W/D, gas FP, grill, A/C, phone, satellite TV, DVD, and wireless MP3 speaker for use with your mobile device. Allows 1 pet. We love love this beautiful cabin. Kitchen has everything you need. View is to die for! Thanks for everything we'll be back! 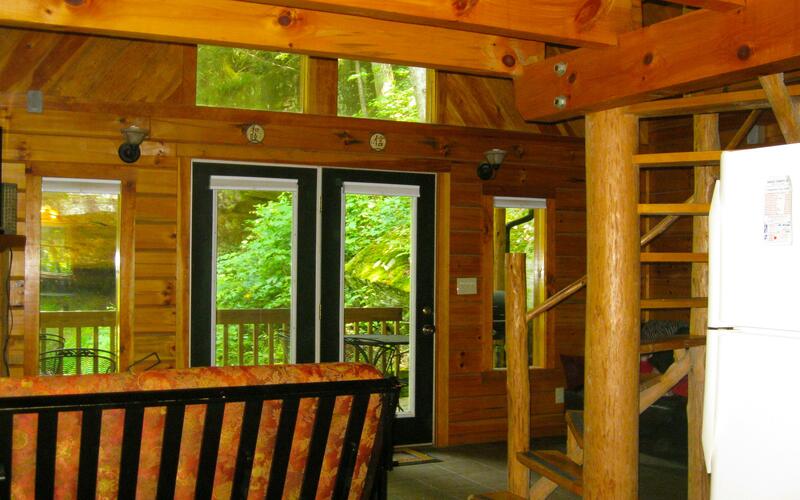 We love love love this beautiful cabin. Kitchen has everything you need. View is to die for! Thanks for everything we will be back. Overall beautiful and exceeded our expectations. Peaceful and relaxing. Will definitely be back. Many things to do close by. Underground gorge is a must visit. This was the perfect place for us to celebrate our 1 yr anniversary. We loved the cabin and the scenery. It was truly tranquil with the sounds of the waterfall and the rest of nature. It was a great location for us for fishing and hiking in the area. We could totally see ourselves coming back to this spot. Thank you.. Loved the cabin! Perfect setting! Had everything we needed for a few days of relaxation. Happy we could bring our dog. Will book spring stay. 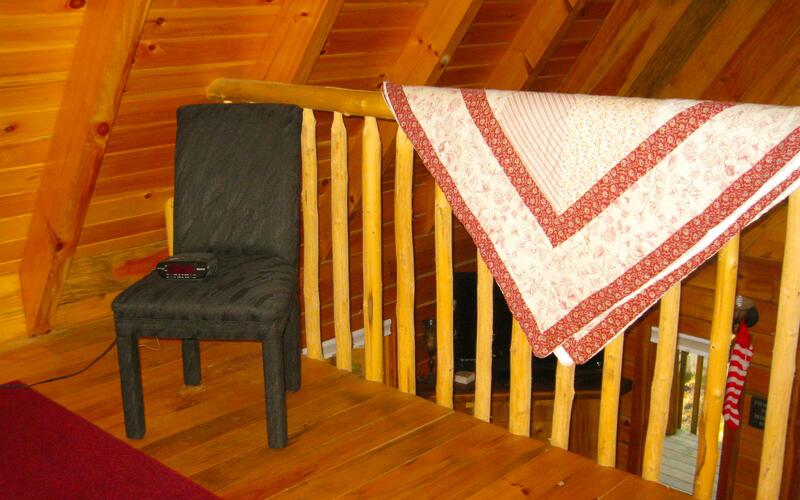 The cabin was lovely and the location and waterfall is amazing! Picturesque, beautiful waterfall to ourselves. Waterfall is much bigger and more beautiful tha appears. Cabin is cozy and everything we need. Love it! Love it! This is one of the most awesome cabins we have ever stayed in. The cabin itself was fantastic, the view of the waterfall wa much more than we expected. 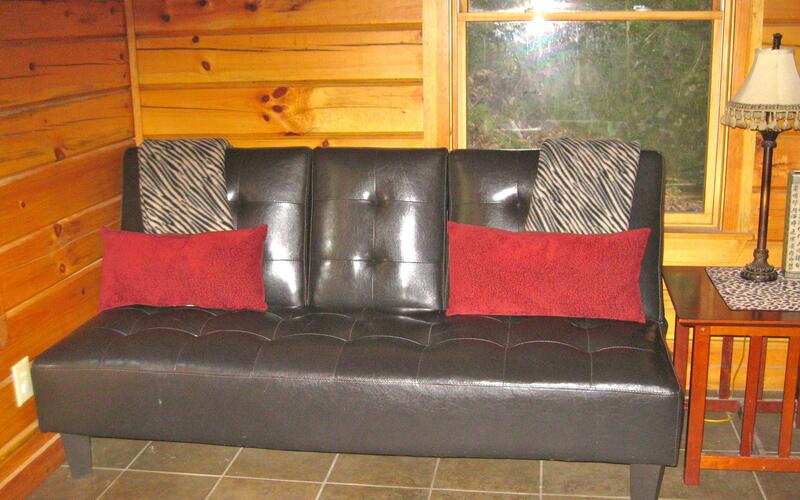 Very well maintained, comfortable, and very relaxing. We will be back soon! We stayed here after getting married(My Tiny Weddings) and had the most perfect honeymoon. The cabin was beautiful and at the view from the porch was so peaceful. 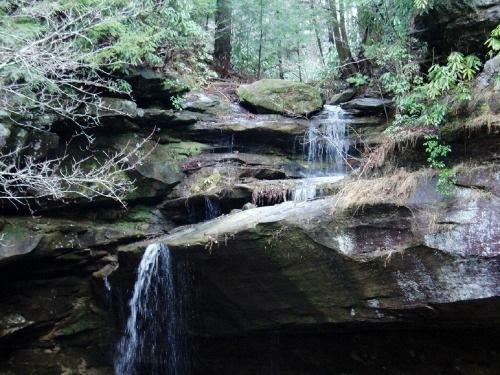 It is in a great location (tucked away with plenty of privacy) but still easy to get to and within 15-20minutes of all the hiking. Staying here was the perfect getaway and a great start to our marriage! Thanks you! We absolutely loved our stay and will return again. The falls and privacy were awesome! 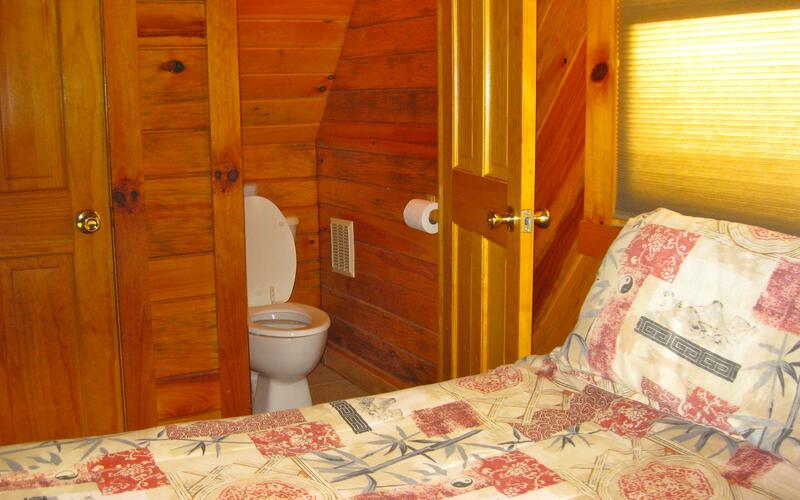 The cabin was well furnished and much appreciated. 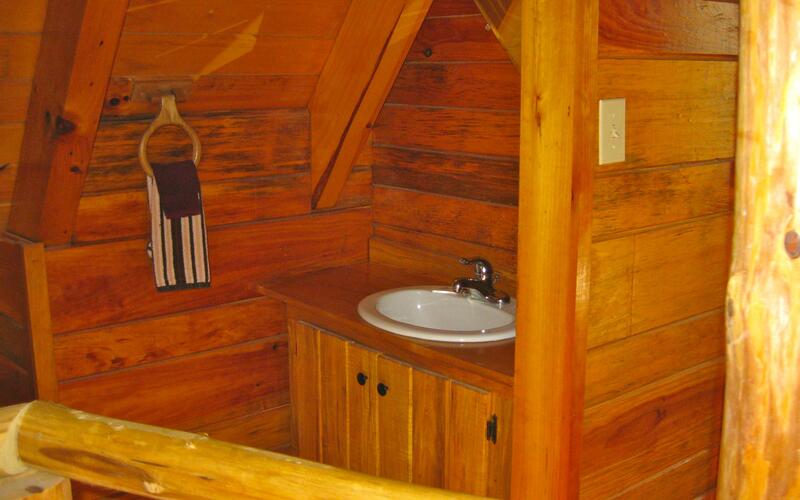 Beautiful cabin with tons of privacy. 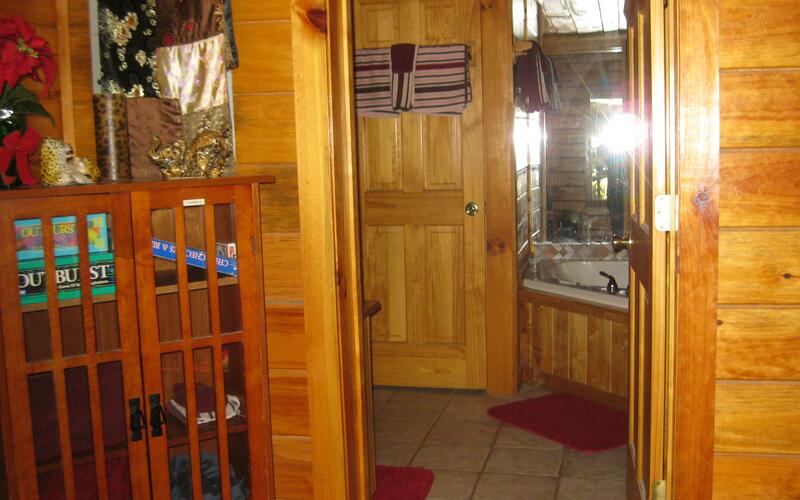 First thing we noticed about the cabin was how clean it was when we arrived. Our one wish was the fireplace was working, but it didn't diminish the experience. We got married in the the Gorge during our stay and the cabin was the perfect place to spend our honeymoon. We plan to make this a yearly visit for our anniversary! 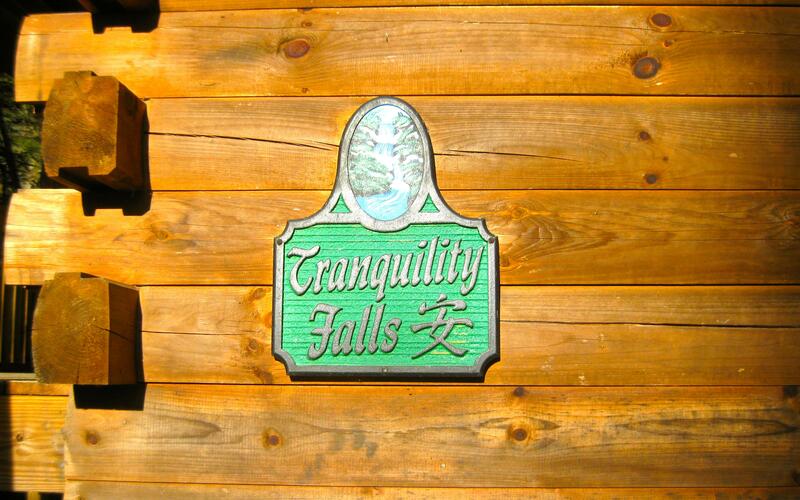 From the beautiful surroundings to the lovely cabin, Tranquility Falls more than lives up to its name. It was with a heavy heart that we packed up our belongings and said "Goodbye" to this pocket of mountain paradise. But we know that we shall return (soon!) 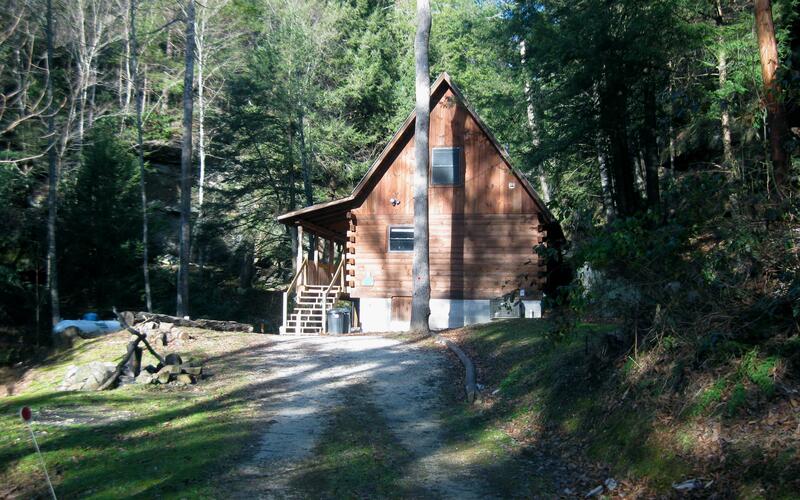 to spend a few more days in the wonderful cabin. Thank you for allowing us this opportunity. Thank you for a wonderful and peaceful weekend. This place is the best. We hope to return soon. Beautiful, beautiful spot and cabin! We had a wonderful stay and the storm just adde to that. From the moment you turn on Jim Smith gravel road the sites are amazing. When we made it to our cabin we couldn't believe how beautiful the outside was and took about twenty minutes just beholding the sites from our cabins deck. 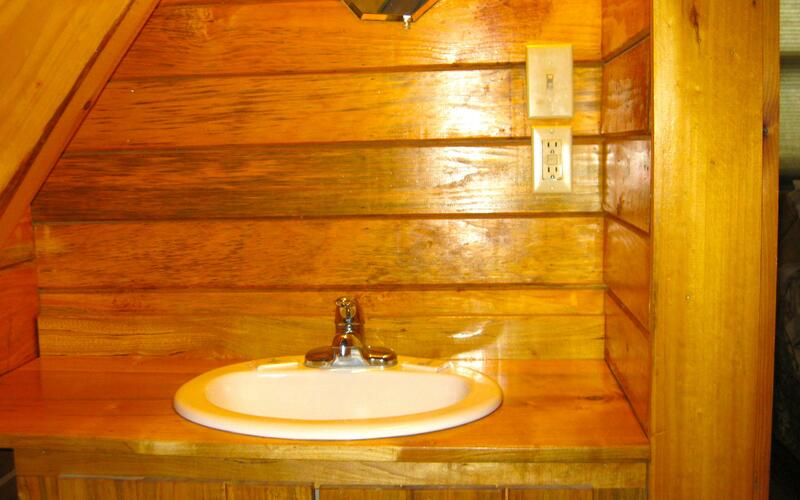 inside of the cabin was just as beautiful as outside. The open windows gave us such a lovely view. 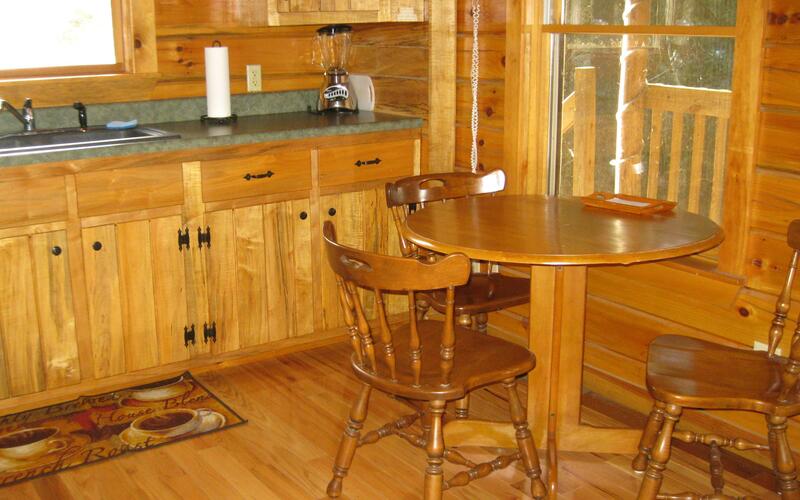 The cabin comes with everything you need, utensils, amenities. It's awesome. This will be a weekend you won't soon forget. We will definitely be back!! "Tranquil" is so correct. Most spectacular cabin I have ever been in. The view was breathtaking, and the light on the falls at night jut made it even more wonderful. 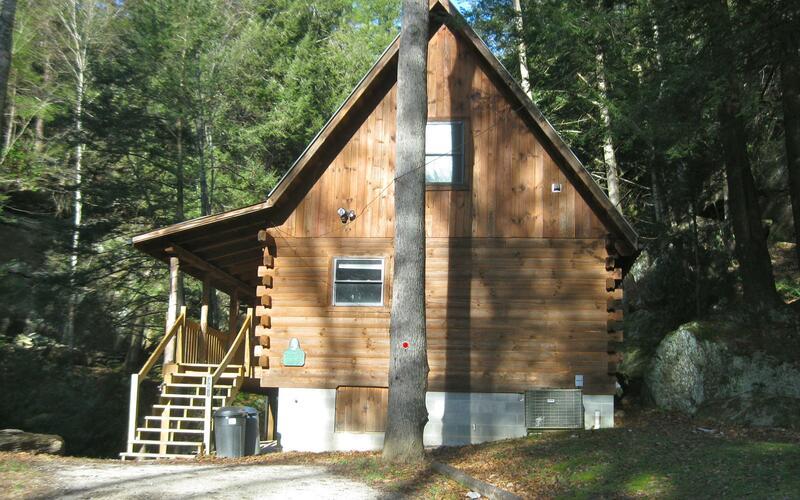 The cabin its self was perfect for our honeymoon. 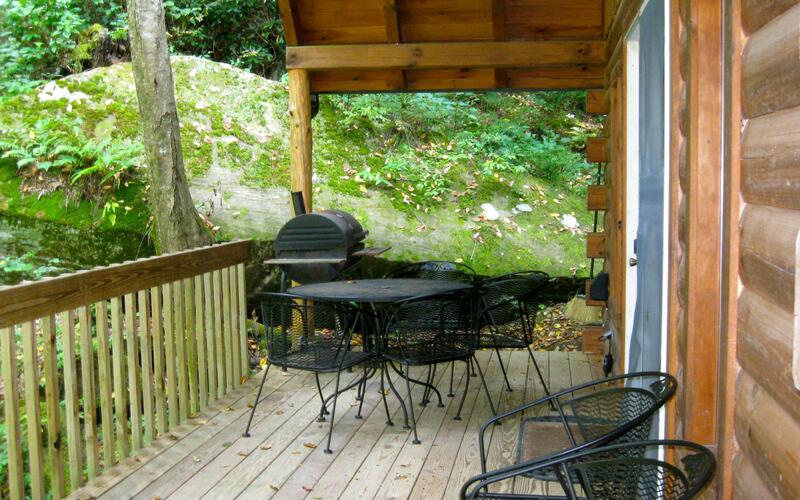 TRANQUILITY FALLS was an idyllic home away from home set in the most enchanting, secluded nature haven. We could not have asked for a more beautiful, relaxing escape. 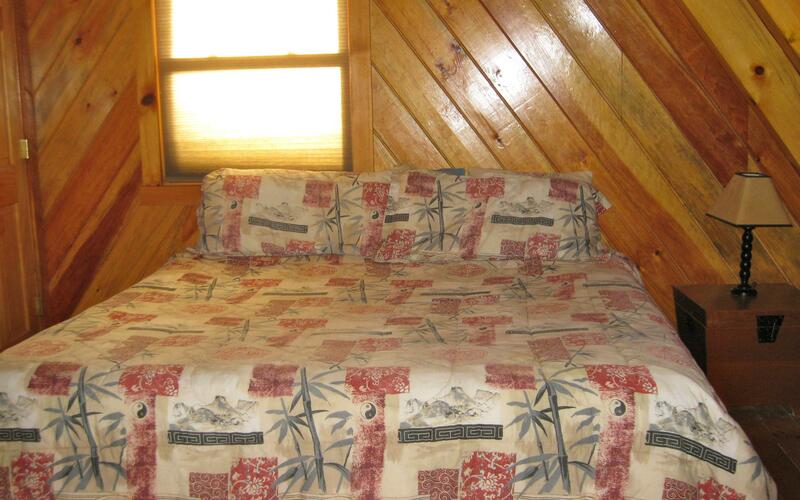 The cabin was so clean, comfortable and well equipped. Having our own waterfall was spectacular! We enjoyed it from our porch every day. It was so peaceful and refreshing! 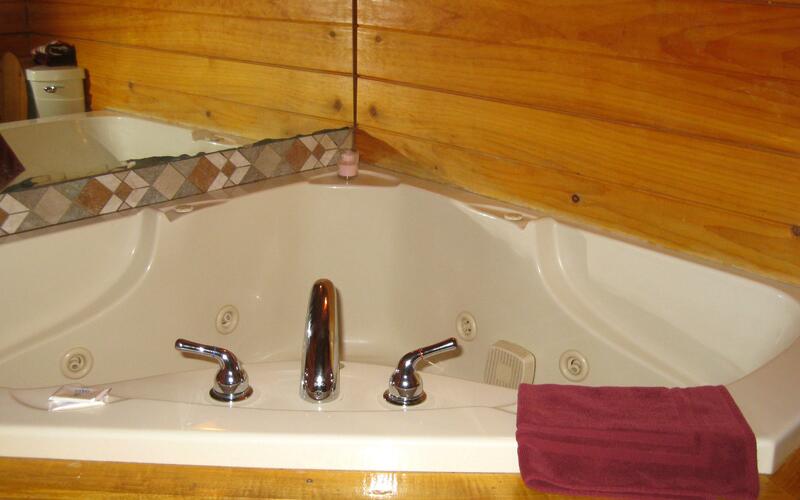 Your builder did an amazing job in showcasing the waterfall from every room-including the whirlpool tub in the bathroom. We will definitely come back for another five-star, rejuvenating escape! Thank you so much for sharing your dog-friendly home with us. 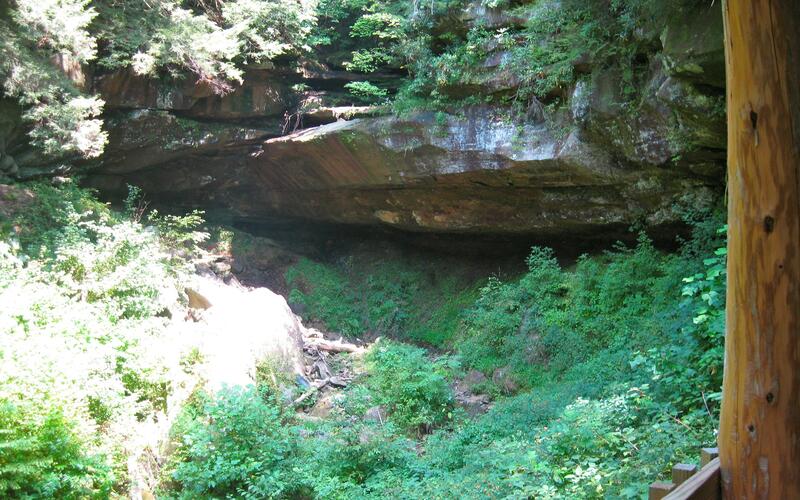 adding to a truly wonderful weekend at Red River Gorge/Natural Bridge. Loved our stay! 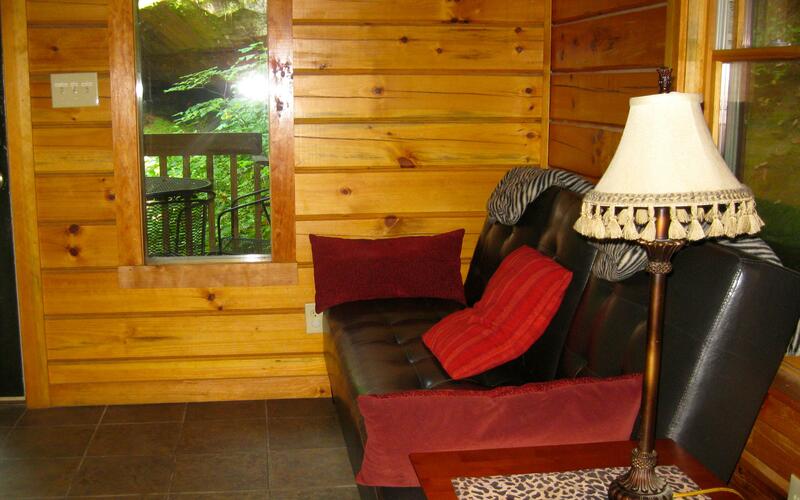 The cabin was perfect and our favorite part was the waterfall and beautiful view. It was easy to find and secluded just enough to make you feel like we were the only ones in the woods, We will be back.